The closest thing to time travel. That’s what today’s photo recommendation gives you through more than 100,000 photos that allow you to track the growth of Minneapolis — and the rest of the state — from the sky. I’m not aware of any larger local source of aerial photography than Minnesota Historical Aerial Photos Online (MHAPO). The collection is part of the John Borchert Map Library at the University of Minnesota. It was created by Joseph Koeller in consultation with the Borchert Library staff. I’ve written before of the Borchert Map Library because I use their maps often, especially their plat maps of Minneapolis from 1892 and 1903, which I have on my “favorites” bar on my computer. While researching the history of the auto tourist camp, which the park board operated at Minnehaha Falls from 1920s into the mid-1950s, I wanted to get some sense of the layout of the 35 cabins that were offered for rent on a nightly basis. I had never found any depiction of the layout of the camp until I found this photo from October 1953 at the MHAPO site. 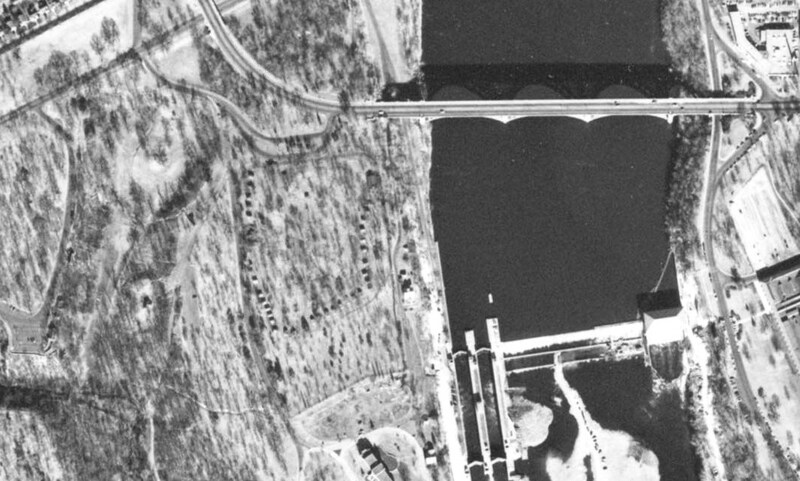 See the U-shape of dark dots on the bluff to the left of the Ford Dam? Gotta be those cabins. It’s the Wabun picnic area now. I’ll be writing more about the tourist camp soon. 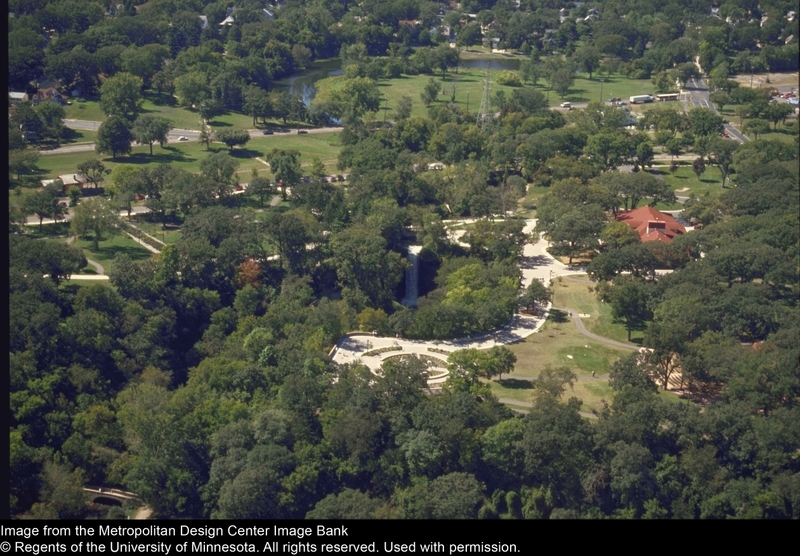 For more recent aerial photos of many parts of Minneapolis and the metropolitan area, I go to the University of Minnesota’s Digital Content Library. Below are two photos from that collection using the search term “Minnehaha Park.” They provide a marvelous way to track changes in the landscape. The only shortcoming of this superb collection of images is that they are not dated. Long ago you could drive up to the edge of Minnehaha Falls. You could watch the falls from your car. A park drive passed between the falls and the pavilion with the red roof. After the 1992 renovation of the park, the parking lot was moved away from Minnehaha Falls and cars could no longer drive right to the edge of the gorge. The former parking lot was replaced by the garden in this picture, which features some verses from Henry Wadsworth Longfellow’s “Song of Hiawatha”, to which the Falls owed its world-wide renown. 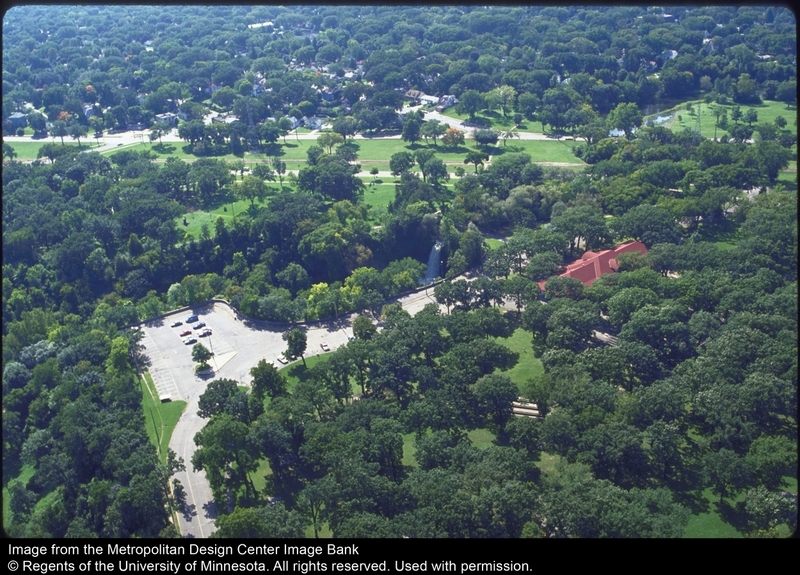 Note that both photos were taken before Hiawatha Avenue was expanded and put under a land bridge at Minnehaha Parkway (upper right corner of the photos) in the 1990s. Had the Minnesota highway department had its way, the horizontal stretch of green near the top of the picture would have become an elevated freeway in the 1960s. The Minneapolis park board went all the way to the U. S. Supreme Court in a successful effort to block that freeway. That is an important story of true park heroes, such as Robert Ruhe, Walter Carpenter, Ed Gearty and others, which I hope to tell in greater detail soon. Some of the photos and maps in the Digital Content Library collection require login to see more than a thumbnail, but many permit viewing in greater detail by the general public. It’s worth noting that both the Borchert and Digital Content Library collections are the product of our state university—a demonstration that all of us can benefit from the presence of a major university in our community. Our taxes at work! Yeah, I complain about taxes too, but things like parks and libraries and universities and historical societies contribute enormously to the richness of our lives. My life anyway. Nearly all the resources I draw on to produce these articles are public resources. They are available to all without charge. They are an important part of our heritage—and, I hope, our legacy. It’s an excellent source, Joe. Joe’s comment on lost golf courses refers to conversations we’ve had for a book he’s researching on Minnesota golf courses that no longer exist. I look forward to reading that — in the near future I hope. There’s a fine aerial postcard which shows the old parking lot. They used to sell it at Sea Salt, but I dunno if they still do. That chrome postcard photo was credited to Bruce T. Sherve, who appears to be in the phone book. Thanks, Karen. Everyone with an interest in historical photos of Minnehaha Falls should visit Karen’s website urbancreek.com. Great stuff there. Another site is Historicaerials.com. They offer various years and include comparison and other helpful features. For our area, the earliest currently is 1947. This was added a couple years ago and I hope to see the earliest 1937 in the future. Thanks, Dan, I’ll check that out.